Ireland’s licensing regime for oil and gas exploration is “weak” and fails to ensure any guarantee of supply to the Irish market, the Oireachtas climate committee heard today. 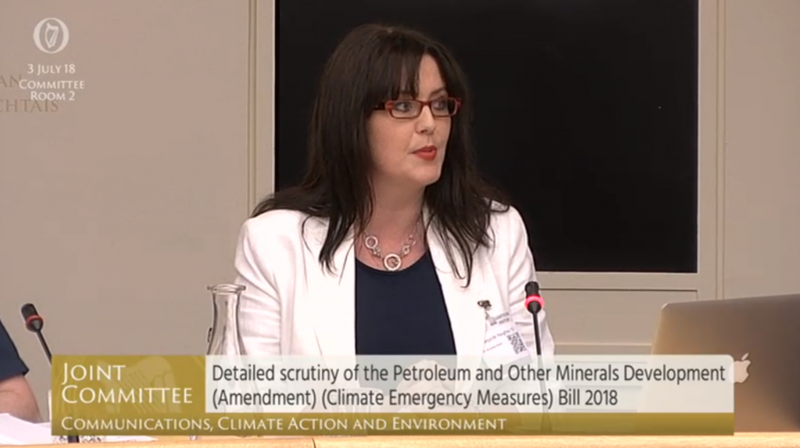 Speaking before the Committee during scrutiny of the Climate Emergency Measures Bill, Dr Amanda Slevin said that exploration for gas and oil in Irish waters is not necessarily benefiting the state. The People Before Profit Bill seeks to amend the Petroleum and Other Minerals Development Act 1960 to stop the Government from issuing any new licenses for the exploration and extraction of fossil fuels. The Bill passed Second Stage in the Dail in February despite Government opposition, with 78 TDs voting in favour. There are currently over 40 licenses granted for a range of fossil fuel, some of which have contracts up to the late 2020s. Dr Slevin, whose research is focused on hydrocarbons management, said that the low tax rate in Ireland is one of the “most generous” in the world. Yet, private companies currently drilling in Irish waters are “under no obligation” to sell gas and oil back to the state, she said. “The state body responsible for responding to climate change also promotes hydrocarbon exploitation and transfers public resources to private interests, undertaking conflictual roles that do not correspond with any notion of sustainability,” she warned. The current policy objections have ensured that Ireland’s position on transitioning to a low carbon economy has “lost international credibility,” said Maynooth University Emeritus Professor John Sweeney at the hearing. The Bill, according to Professor Sweeney, would help in “restoring Ireland credentials.” Measures included in the Bill would also make a “positive contribution to national and international climate obligations” and “encourage energy security” through renewables, he added. A report from Climate Action Network (CAN) Europe recently ranked Ireland as the second worst EU country in tackling climate change. Ireland’s 2020 target is to reduce the greenhouse gases emissions by 20 per cent compared to 2005 levels, however, the Environmental Protection Agency projects that we will only achieve a one per cent reduction. IBEC spoke out against the Bill at today’s hearing, with the lobby group’s Senior Energy Policy Executive, Conor Minogue, stating that the Bill could “undermine national energy security” if Ireland is left to rely on foreign oil and gas. There is a gas supply from the Kinsale and the Corrib field, however, both are expected to face critical production issues by 2025. While accepting that a failure to address climate change will put our “environment, society and economic well-being at great risk”, Mr Minogue said that we must follow the “most cost-effective pathway open”. He said that energy modelling to date points to the “continued role” for natural gas as a key transitionary fuel, adding that the business group is concerned that the Bill overlooks “the vital role natural gas plays in our economy today”. “Yes, it is a fossil fuel, but it is the cleanest fossil fuel available and has applications in heat, power generation and transport,” he added. A 2017 study from the Tyndall Centre for Climate Change Research indicates that EU States can afford just nine more years of burning gas and other fossil fuels at current rates of consumption before they exhaust their share of the carbon budget to keep global temperature rises below 2°C. “An urgent programme to phase out existing natural gas and other fossil fuel use across the EU is an imperative of any scientifically informed and equity-based policies designed to deliver on the Paris Agreement,” the report states. According to An Taisce, IBEC’s support for continued hydrocarbons exploration runs contrary to the goals of the Paris Agreement and indicates support for “sustained profits based on climate-polluting fossil fuel use”. 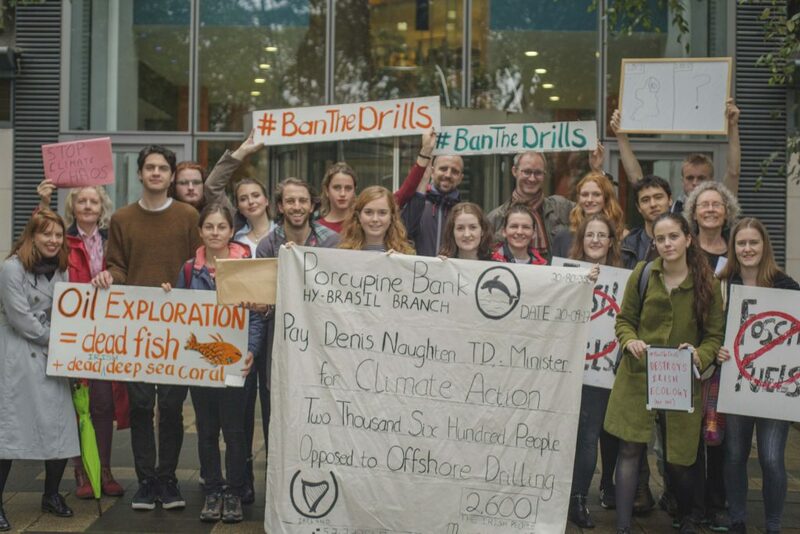 “By making an explicit national commitment to ending unnecessary fossil fuel exploration, the Bill gives a strong societal declaration that Ireland means business in driving a focus on rapid, decarbonisation,” the environmental charity said in a statement this afternoon. The chairman of the Irish Offshore Operators’ Association, Pat Shannon, said during the hearing that the transition away from fossil fuels “must be realistic” and that revenues from hydrocarbon drilling could go toward the development of renewables. Matthew Collins of the Department of Climate Action said at the hearing that natural gas use will be “lower” in the future but will maintain “a significant place” in the market for the near future. Natural gas should represent almost one quarter in the energy sector by 2050, he added. 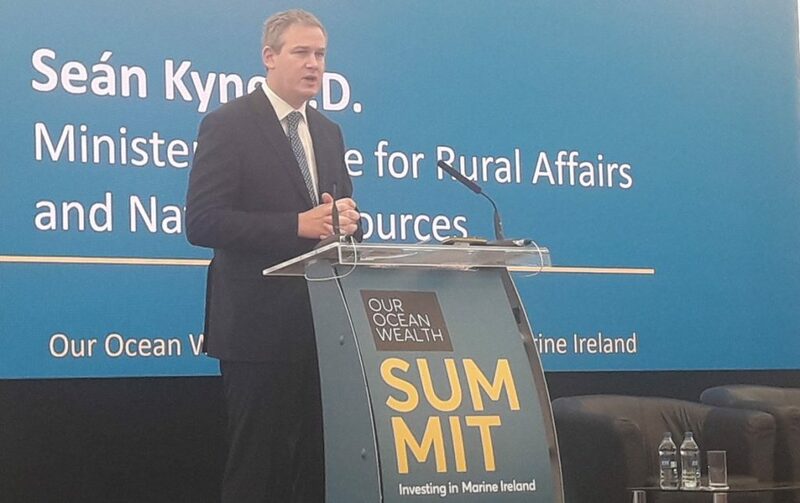 During the Our Ocean Wealth Summit last week, the Minister of State for Natural Resources, Seán Kyne, TD outlined the Government’s support for an increase in drilling. Offshore oil and natural gas can deliver energy security and be a “very significant economic driver”, he said. His comments encouraged strong reproach from environmental and civil society groups, such as Stop Climate Chaos. “More licenses for drilling means more oil and gas which means locking in more fossil fuel infrastructure and usage preventing greater investment in renewables,” the civil society coalition said. “Oil wells produce toxic chemicals. Not good news for our oceans or our valuable fishing industry,” added the campaign group Not Here Not Anywhere.